Cattle At South Lopham in Norfolk, England is the Ox-Foot Stone, which previously lay in a meadow still known as the Oxfoot Piece, and bears the supposed imprint of an ox's foot. The legend goes that in a time of great famine, a miraculous cow appeared and provided a never-ending supply of milk to the starving poor. When the famine ceased, the cow struck its hoof against the stone leaving the imprint and then vanished. The stone itself is a flattish slab of sandstone about 60 cm x 90 cm, likely deposited during the last ice age as a Glacial erratic, and the 'hoofprint' is probably the imprint of a fossil bivalve. This part of East Anglia has virtually no naturally-occurring stone (local geology being boulder clay with flints overlaid on chalk), so the Stone's very existence would have been notable. The stone now stands outside the door of Oxfootstone Farm House. 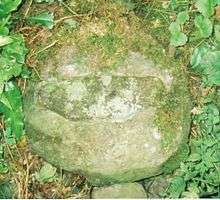 On a natural stone in Cornwall is a foot-shaped impression in a rock in the valley leading to the cliffs and coastal footpath near Chapel Porth. It is said to be the foot mark of Giant Bolster of St Agnes legend. Just below the formation, there used to be a Holy Well dedicated to St Agnes, but it dried up due to the mining in the area. 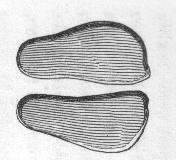 Footprints at North Yell, up Hena, in Shetland were thought to be lost but were rediscovered in 1969 by the ordnance survey. 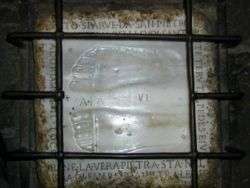 The footprint, 12" by 4", is known locally as the "Wartie" and was used to wash in dew or rainwater, and standing in it was supposed to get rid of warts. In legend, it was made by a giant placing one foot here and the other on the Westing of Unst. In Bristol, the giants Vincent and Goram dug the Avon gorge and left their footprints. Moso's Footprint in Samoa was made when the giant Moso stepped over to Samoa from Fiji, and the other footprint can be found on Viti Levu of Fiji. It is a 1 m by 3 m rock enclosure. At the foot of the Doa mountain in Vietnam, towards the west, is a big rock. There are two human footprints on the rock. It is said that the footprints belonged to a giant who used to help the villagers with the construction of their houses. Unfortunately, one of the footprints has been damaged. 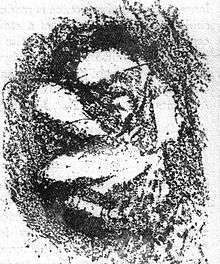 At Arthur's Stone chambered tomb in Herefordshire is a "cup mark" stone which bears the imprints of a giant's (or king's) elbow, left behind after he fell dead to the ground, killed by King Arthur. The Maqām Ibrāhīm ("Abraham's place of standing") is a rock kept in a crystal dome next to the Ka'bah in Mecca. 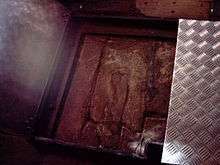 The footprint in it is believed, by Muslim tradition, to have been made by Abraham when he was lifting stone blocks to build the Ka'bah. A diminutive pair of hands are carved on a boulder beside the Crinan Canal in Argyll. 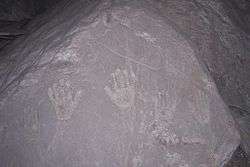 The St. Victor's Petroglyphs Provincial Park, in Saskatchewan, Canada, feature hand-prints. From Waldenbuch in Germany is a four-sided stone pillar with scroll carving and a left arm and hand. At Oberhasli on the road to Gadmen near Meiringen in Switzerland is the Sterbensstein, a rock with the impression of a hand and several fingers left by a dying man after he had been attacked. Near Minden in the Geismarwald on the Totenberg in Germany, an army leader who before a battle in the 30 years wars declared that he had as much chance of winning as he had of the stone becoming soft. It did, and his foot- and hand-prints are still there to be seen by all. 1 2 3 4 Thomas, F.W.L. & Scot, S.A. (1878–79). Dunadd, Glassary, Argyllshire. Proc Soc Antiq. Scot. Vol. 1. - New Series. Pps. 28–47. ↑ "The Burdick Print". Paleo.cc. Retrieved 2014-05-12. 1 2 3 4 5 Folklore, Myths & Legends of Britain. (1973). Reader's Digest. London. 1 2 3 Westwood, Jennifer (1985), Albion. A guide to Legendary Britain. Pub. Grafton Books. London. ISBN 0-246-11789-3. P. 274. 1 2 3 4 5 Ralls-MacLeod, Karen & Robertson, Ian. (2003). The Quest for the Celtic Key. Luath Press. ISBN 1-84282-031-1. P. 116. ↑ Westwood, Jennifer (1985), Albion. A Guide to Legendary Britain. London: Grafton Books. ISBN 0-246-11789-3. pp. 147–148. ↑ Baring-Gould, Sabine & al. The Lives of the British Saints: The Saints of Wales and Cornwall and Such Irish Saints as Have Dedications in Britain, Vol. II, pp. 422 ff. Chas. Clark (London), 1908. Hosted at Archive.org. Accessed 18 November 2014. 1 2 3 4 Pennick, Nigel (1996). Celtic Sacred Landscapes. Thames & Hudson. ISBN 0-500-01666-6. P. 41. ↑ "A Gazetteer of Arthurian Topographic Folklore". Retrieved 2006-03-07. RCAHMS – various reports from the Historic Scotland Canmore website. ↑ McHardy, Stuart (1999), Scotland: Myth, Legend & Folklore. Pub. Luath Press, Edinburgh. ISBN 0-946487-69-3 P. 62. ↑ Ardrossan & Neighbourhood. Guide. 1920s. P. 29–30. ↑ Brooke, Daphne (2006). Saints and Goddesses : The Interface with Celtic Paganism. Whithorn : Friends of the Whithorn Trust. 7th. Whithorn Lecture. page 17. ↑ Westwood, Jennifer (1985), Albion. A guide to Legendary Britain. Pub. Grafton Books. London. ISBN 0-246-11789-3. P. 262. 1 2 "St. Victor". Tpcs.gov.sk.ca. Retrieved 2014-05-12. 1 2 Wall, J. Charles (1912), Porches and Fonts. Pub. Wells Gardner, Darton * Co. London. P. 39. ↑ Westwood, Jennifer (1985), Albion. A Guide to Legendary Britain. London: Grafton Books. ISBN 0-246-11789-3. p. 308. ↑ "Frauenkirche". Destination Munich. 2011. Retrieved 20 August 2011. 1 2 3 4 5 Breeze, David & Munro, Graeme (1997). The Stone of Destiny. Symbol of Nationhood. Historic Scotland. ISBN 1-900168-44-8. Pps. 12–15. 1 2 3 Strong, John S. (2004). Relics of the Buddha (Buddhisms: A Princeton University Press Series). Princeton University Press. p. 87. ISBN 0-691-11764-0. ↑ "Chapel of the Ascension". Sacred-destinations.com. Retrieved 2014-05-12. 1 2 Bord, Janet (2004). Footprints in Stone. 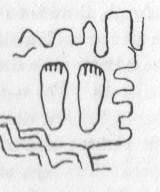 The significance of foot- and hand-prints and other imprints left by early men, giants, heroes, devils, saints, animals, ghosts, witches, fairies and monsters. Heart of Albion Press. ISBN 1-872883-73-7. ↑ Pennick, Nigel (1996). Celtic Sacred Landscapes. Thames & Hudson. ISBN 0-500-01666-6. P. 40. ↑ Pennick, Nigel (1996). Celtic Sacred Landscapes. Thames & Hudson. ISBN 0-500-01666-6. P. 134. 1 2 Westwood, Jennifer (1985), Albion. A Guide to Legendary Britain. London: Grafton Books. ISBN 0-246-11789-3. p. 418. 1 2 3 4 5 Sharp, Mick (1997). Holy Places of Celtic Britain. Blandford. ISBN 1-85079-315-8. P. 89. 1 2 3 RCAHMS – various reports from the Historic Scotland Canmore website. ↑ "History of Howth - Lonely Planet Travel Information". Lonely Planet. Retrieved 2012-02-14. ↑ Sharkey, John (2004). The Meeting of the Tracks. Rock Art in Ancient Wales. Gwasg Carreg Gwalch. ISBN 0-86381-853-6. Pps. 32–35. 1 2 Cope, Julian (2004), The Megalithic European. Pub. Element, London. ISBN 0-00-713802-4. P. 125. ↑ "Rittersprung". Heidelberger-altstadt.de. Retrieved 2014-05-12. ↑ David Perlman, Chronicle Science Editor (2003-03-13). "Stone Age human tracks found". Sfgate.com. Retrieved 2014-05-12. ↑ Barnaby, Wendy (April 17, 1975). "International News 'picture story'". Nature. 254 (5501): 553. doi:10.1038/254553a0. ↑ Hadingham, Evan (1974). 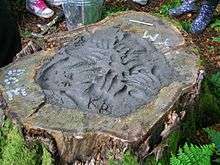 Ancient Carvings in Britain: A Mystery. Garnstone Press. ISBN 0-85511-391-X. p. 88. ↑ Agius, A.J. The Hypogeum at Hal-Saflieni. Freedom Press. Malta. p.19. ↑ Proc. Sco. Antiq. Scot. Vol. XCVII. 1963–1964. p. 249. ↑ McHardy, Stuart (1999), Scotland: Myth, Legend & Folklore. Pub. Luath Press, Edinburgh. ISBN 0-946487-69-3 p. 108. 1 2 3 Sharp, Mick (1994). A land of Gods and Giants. Frazer Stewart Books. ISBN 1-85648-214-6. P. 133. ↑ Fox, Aileen (1973). South-West England 3500 BC - AD 600. Pub. David & Charles. ISBN 0-7153-6209-7. P. 68. 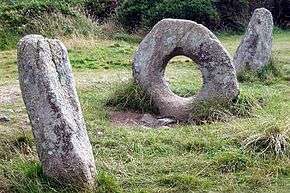 ↑ An Inventory of the Ancient Monuments in Wales and Monmouthshire. V. County of Carmarthen. (1917). Roy. Com. Anc. Hist. Monu. Const. in Wales & Mon. P. 33. ↑ Piggott, Stuart 1985. The Druids. Thames & Hudson. ISBN 0-500-27363-4 P. 51. ↑ Matthews, John (2004). The Quest for the Green Man. Pub. Godsfield. ISBN 1-84181-232-3 P.107. ↑ Atkinson John A. (2000) Excavation of 10th-century burials at Chapelhall, Innellan, Argyll, 1994. P.S.A.S. 130, P. 651–676. 1 2 Isler H, Hasenfratz H, O'Neill T. A sixth-century Irish headache cure and its use in a south German monastery. Cephalalgia. 1996 Dec;16(8): P. 536–40. ↑ Holder, Geoff (2007). The Guide to Mysterious Perthshire. Stroud : Tempus. ISBN 978-0-7524-4140-5. p. 140. ↑ Meehan, Aidan (1996). Celtic design. Maze Patterns. Thames & Hudson. ISBN 0-500-27747-8 Pps. 54–55. ↑ "Druids and bullauns". Legendarydartmoor.co.uk. Retrieved 2014-05-12. ↑ Tuck, C. (2003).Landscapes and Desire. Pub. Sutton. Stroud. ↑ Graham, Frank (1990), Hadrian's Wall in the Days of the Romans. Pub. Frank Graham. ISBN 0-85983-177-9. P.230. ↑ The Megalithic Portal and Megalith Map (2007-10-28). "Valhaugen". Megalithic.co.uk. Retrieved 2014-05-12.